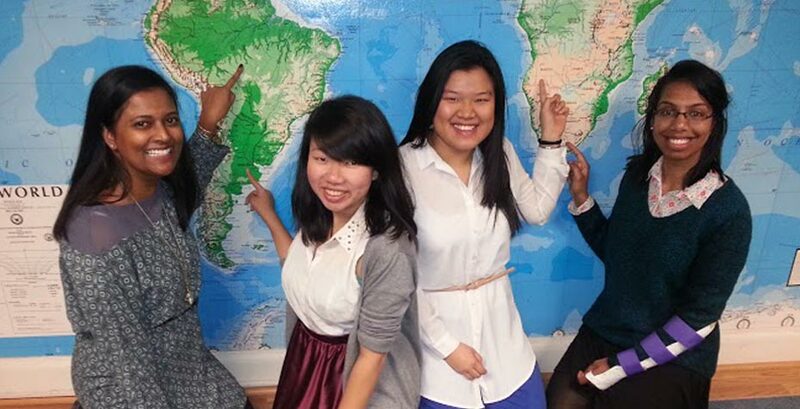 Fiona Almeida DS'15, Amanda Hui '15, Allison Leow '15 and Nevatha Mathialagan '15 were recently nominated by Wellesley to represent the College in the national Watson Fellowship competition. The Watson Fellowship provides the opportunity for up to 40 graduating seniors to travel the world each year in pursuit of a personal project. In 1968, the Thomas J. Watson Foundation began allocating generous funds for the Watson Fellowship, in recognition of Mr. and Mrs. Watson’s deeply invested commitment to education and world affairs. The fellowships are awarded to individuals expressing global awareness and proposing a project that explores a personal conviction. Watson Fellows are given the agency as researchers to create, execute, and evaluate their own projects. This is an opportunity for young graduates to pursue a compelling subject with self-directed discovery. The $28,000 stipend supports a 12-month period of research and exploration abroad. Last year, the Watson Foundation awarded fellowships to three Wellesley graduates: Beatrice Denham '14, Mayrah Udvardi '14, and Audrey Wozniak '14. “In many cultures the body is a canvas used to communicate cultural traditions and to express one’s identity,” Almeida explains. After conducting fieldwork in rural Karnataka for two summers; researching, implementing health programs, and teaching English to young children, Almeida had opportunities to participate in henna ceremonies. She gained a deeper understanding of the culture and the social bonds that were kindled among the women during the henna ceremonies. Through her proposed Watson project, "Temporary Body Painting and Staining Practices: The Formation of Social Bonds Among Women," Almeida seeks to explore the diversity of art forms associated with the practice her title describes. She plans to travel to Namibia, Brazil, Australia, and Indonesia to not only observe and document, but also participate in body painting rituals. In this way, she hopes to study how the process of body painting and staining creates communities for women that maintain their history and traditions. Prior to Wellesley, Hui attended a United World College in Victoria, B.C., Canada where 200 students hailing from over one hundred countries lived and studied together. This experience introduced Hui to the beauty of multinational engagement. She later helped organize TEDxBeijing in Summer 2013 and this past spring contributed to TEDxWellesleyCollege. Through her proposed Watson project, "What’s in a Smile? An Anthropological Perspective of Oral Health," Mathialagan hopes to travel to Switzerland, Hong Kong, Nepal, South Africa, and Peru, employing an anthropological approach to study oral healthcare infrastructures and attitudes toward oral health at the international, national, and local levels. She will observe and interview dentists, public health officials, professors, alternative medicine providers, aestheticians, and volunteers. This project will allow Mathialagan to gain an understanding of oral health policymaking and varying cultural attitudes toward oral health across the five countries she intends to examine. During high school, Allison Leow discovered political organizing as an outlet for her interest in politics and affinity for initiative. At Wellesley, Leow pursues a major in economics; arranges trendy grooves for the College’s station, WZLY; and is involved in the Wellesley Asian Alliance, a social justice organization for Asian and Asian American students. She also continued developing her experience in political organizing by spending her summers involved in compliance positions with a myriad of national, state, and local political campaigns. Leow now hopes to pursue her interest in political organizing through her Watson project, titled "Political Organizing and Election Culture Across Nations." She will be travelling to Argentina, Taiwan, and Iceland to observe their presidential elections, specifically, observing the role of grassroots organizing in political campaigns, the impact that elections have on ordinary citizens, and the influence of technology and media on elections within the vastly different environments of the three countries.